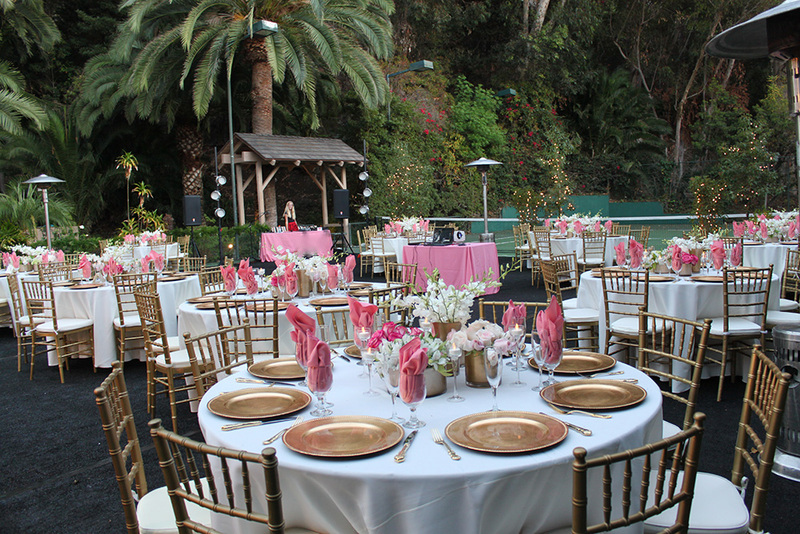 Recently we were asked to coordinate and decorate a garden wedding at a beautiful and picturesque estate in Malibu. The location was a wedding planner’s dream. Surrounded by lush foliage and spacious grounds, the home was the perfect spot for a Bride and Groom’s special day. 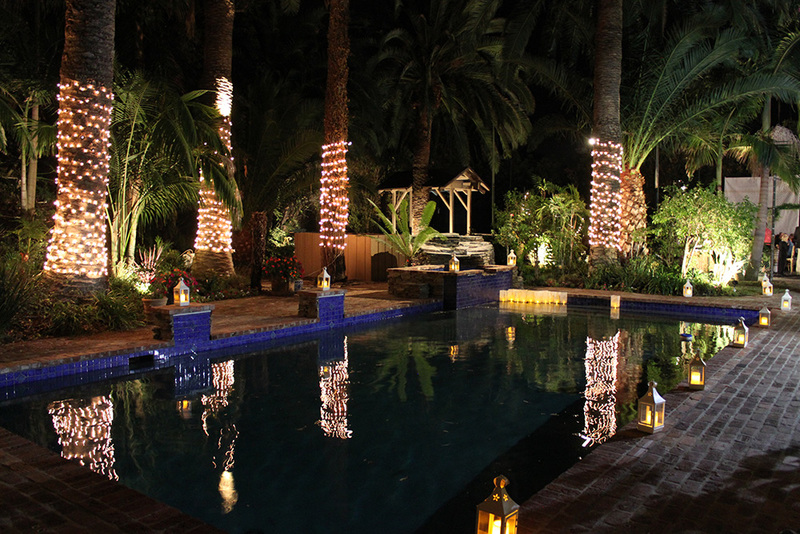 Each stage of the wedding took place at a different setting on the property. As guests arrived, they presented their gifts and signed in at the entrance, near a refreshing beverage station. The ceremony took place in the spacious main living room. The bride decended the staircase and entered the ceremony area accompanied by a string quartet. Following the ceremony, guests visited with friends and family for a garden cocktail hour. 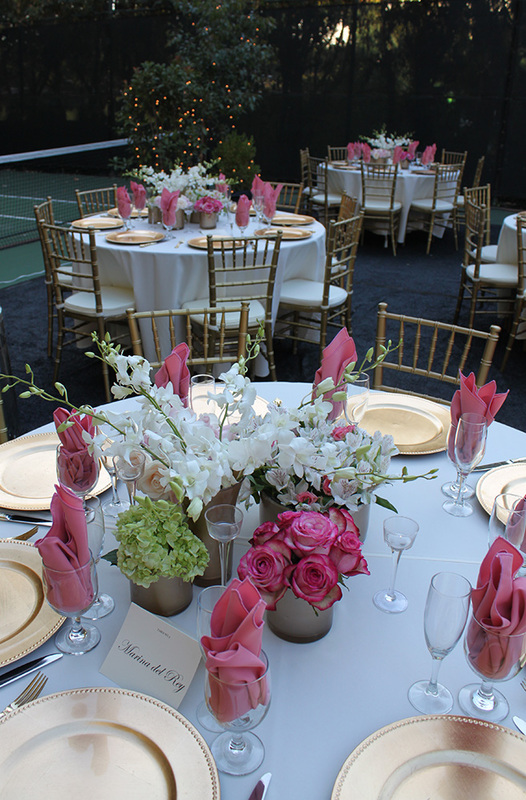 Attendees then moved to the decorated tennis court where an appetizing dinner was served. While dining, guests were entertained with a video story and slide show featuring the newlyweds. Following dinner, toasts were made by the bridal party and the cake was cut. DJ Melinda played the Bride and Groom’s song selections while guests celebrated the special occasion by dancing late into the evening. Finishing touches on the beautiful estate included accent lighting, draped fabrics and elegant florals. The amazing menu was prepared by Shelly Moore and the floral arrangements created by Darlene Tofua. Thanks to everyone for a great and memorable special day.